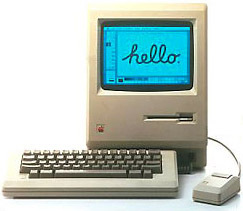 Traditionally, the Apple "Mac" Macintosh computer has been known for desktop publishing, Photoshop, audio and video editing, networking, and high prices, not gaming. (In fact, Apple management for some time actively discouraged any attempts to turn the Mac into a gaming machine, because they envisioned it as a business tool and feared that gaming would add to the already somewhat whimsical image of the computer.) But despite this it has a gaming history, including a small number of original titles, most famously Myst and Marathon. Another ironic moment is that, due to being based on the popular Motorola 68000 CPU, widely used at the time in various video game platforms, the Mac had a long history as an authoring platform for console games in the eight-bit and 16-bit era. The Mac was a revolutionary computer, with its Xerox Alto-inspired graphical user interface, (though Mac OS X made it so modern Macs have a terminal feature to provide text-based functions other UNIX-based operating systems have) and Apple marketing executives were worried that it would be seen as a toy. So the only games developed for it prior to its release in January 1984 were a 600-byte Puzzle Game and a real-time board game by an Apple programmer that went intentionally underpromoted. After the launch, games were ported over from other systems, but there were only a few unique titles. Several companies stepped forward to fill the gap. Silicon Beach's Enchanted Scepters and Dark Castle demonstrated the Mac's mouse-based input and multimedia capabilities, respectively. ICOM Simulations created the first fully mouse-driven Adventure Game in Deja Vu, followed by Shadowgate and two other "MacVentures". In the 1990s, Bungie gave Mac users a reason to be proud with Marathon and Myth. Halo would've been their next Mac title, but Microsoft bought them out and turned it into a launch title for the Xbox. Other major developers included Ambrosia (Escape Velocity) and Casady & Greene (Crystal Quest, Glider). Still another Mac debut, Cyan's HyperCard-based Myst, went on to reign as the all-time best-selling PC game for nearly a decade. The Mac hardware went from the 68k CPU family to the PowerPC, and Mac OS went from Classic to X, but it remained a system of third-party ports from those who were willing. And as the "wintel" platform caught up with the Mac's technical sophistication, porting became more difficult and fewer were willing. Things took a startling change in the mid-2000s. In 2006, the Mac went to the same 80x86 CPU as the IBM Personal Computer, even allowing it to run Windows without the need for an x86 emulator, and thus the vast majority of computer games (i.e. other than what was already available for Mac OS). This made porting easier, but still not a piece of cake; the Mac OS still uses different Application Programming Interfaces, such as OpenGL, in place of DirectX. It also used a different, more sophisticated BIOS called EFI in place of the outdated IBM PC BIOS that PCs were stuck with until Microsoft updated Windows Vista and 7. An upside of the transition was the sudden prominence of the Hackintosh, a standard PC running Mac OS X (versions 10.4 and up); though technically not allowed under Apple's EULA, Hackintoshing opens up a lot of flexibility that Apple doesn't offer on the low end, and there's even a book out there on how to do it. Much like earlier 80x86 competitors to Windows such as Linux, native game ports have mostly died away as a result, replaced with the common CPU architecture's ability to use various types of emulation to run Windows games at a decent speed or simply reboot into Windows using the Boot Camp bootloader software. In particular, a commercial enhancement of Wine called Cider is bundled into most current Mac game "ports", so native Mac games have been reduced from those ported by third parties to those originally written by Multi Platform Mac developers, like Blizzard, id, and (in a recent surprise) Valve, bringing Steam to the Mac. Named after the McIntosh apple, which you can find in the produce section of a grocery store near you. No relation to a Mac(kintosh) coat, Mac(aroni) and Cheese, a McDonald's Big Mac (though you won't believe how often this crops up in jokes in both fandom and hater circles alike), Big Macintosh, a blue dog named Mac, someone who has a blue imaginary friend or somebody on the street yelling "Hey, mac!" to you. See its colorful history here. Macs are generally classified into three eras: Old-World, New-World and Intel. Old-World Macs use the Toolbox BIOS, a proprietary BIOS only capable of loading Mac OS, and they had most of their graphical instructions stored in-BIOS. Later "Old-World" Macs are actually hybrids, they have both Open Firmware (albeit an early implementation) and Toolbox BIOS stored on ROM. The thing that sets these hybrids apart from New-World Macs is that while hybrids store both BIOS's on ROM, New-World Macs only store Open Firmware on ROM, but they are capable of loading the Toolbox off the hard disk into RAM and chainloading Toolbox from there. The Macs of Dark Castle and the ICOM MacVentures. CPU: Motorola 68000, 8 Mhz. GPU: None. Somewhat ironic, but for all the graphical sophistication of its interface the Mac's entire graphical subsystem consisted of a simple DMA video controller, based on just two discrete logic chips, with all graphics drawn in software. The machine's entire chipset fit into just 10 chips (6 programmable logic devices, two custom chips for the clock and floppy drive, an 8530 dual serial port and a 6522 VIA to handle interrupts), a tiny number in 1983 considering most desktop PCs were still being built out of discrete TTL chips (which required dozens of individual chips to do the same thing). Burrell Smith wanted to put the entire machine's guts into one big chip called the "Integrated Burrell Machine", but they couldn't get the chip debugged in time and had to fall back on Smith's original PLD-based design. Apple eventually got it working for the Macintosh SE and Classic, though. 128 KB for the original "thin" Mac, which almost killed the machine — the design team was really challenged to do anything with such a tiny amount, because graphical software required more memory than the old-fashioned character-based one, and applications' constant loading and unloading of the unused software pieces slowed the machine to a crawl, as it didn't have a HDD, just a 400K floppy! The first major update of the system, the "fat" Mac, upped the memory amount to 512 KB. Later models increased it further, to 4 MB. The Macs of Myst and Marathon. This class also includes the oddball SE/30 and Macintosh Classic II, which were both Mac II-class machines (based on the Mac IIx and the LC II, respectively) that just happened to be in the classic "toaster" Mac's form factor. CPU: Motorola 68020, 68030, or 68040, 16-40 Mhz. GPU: Still 100% software; add-on boards with "QuickDraw accelerators" became available around 1990, but they were expensive and mainly intended for professional users. The SE/30 and Classic II used the same 512x342 monochrome screen as the original Macs. However, there were add-ons for the SE/30 that made it just as capable as a full-size Mac II, and even made it possible to display grayscale video on the internal monitor. CPU: PowerPC 601, 603, 603e, 604, 604e, 604ev "Mach 5", or 750 (called "G3"), 60-366 MHz. The 603/604 series Power Macs are unofficially upgradable to G3 chips of up to 400 MHz using third party upgrade kits, while the G3 Power Macs are unofficially upgradable to G4 chips of up to 1.2 GHz using third party upgrade kits. GPU: Either software-driven onboard video, Apple video cards, or PCI cards. Beige G3 Power Macs had onboard 3D acceleration and support for up to 1280x1024 thanks to an integrated ATI Rage II+, Rage Pro Or Rage Pro Turbo chipset, depending on motherboard revision. 8-384 MB, unofficially up to 1.5 GB. The "PowerSurge" machines (the 7500-9500 and their follow-ons) used an oddball transitional memory standard, the "fast-page DIMM". These were available in sizes up to 128 MB; the 7500 and 8500 had 8 DIMM slots, and the 9500 has 12, making their maximum RAM 1 GB and 1.5 GB, respective—both huge numbers for consumer machines in 1995. The Beige G3s switched from fast-page RAM to the then-new (but far easier to get) PC100 SDRAM. RAM modules must be double-sided or the computer will exhibit memory-related issues like not reporting all the RAM installed or randomly crashing on boot. All-in-one and Desktop models require low-profile RAM. Also, good luck hunting down three double-sided 512MB modules that work with the system to achieve 1.5GB of RAM, as not all of them work- why the other wiki states that the maximum most people settle with is 768MB of RAM, while Apple themselves states the limit at an extremely conservative 384MB. The PowerSurge machines could handle up to 4 MB of Video RAM, using an on-board, Apple-designed frame buffer chip. The Beige G3 upgraded to an ATI Rage GPU, which came with 2MB onboard; another 4MB can be added via a SGRAM module. All of these machines accept PCI video cards, though getting one working in a PowerSurge is tricky because of the old BIOS. 640x480 with 16-bit color on internal video. Up to 1280x1024 and up to 24-bit color with PCI cards. Beige G3s can achieve 1280x1024 at 24-bit color using the onboard video if a 4MB video SGRAM upgrade module is present. 603/604: 7.5.3 - 9.1 (9.2.2 can be force-installed using third-party software); 604 models can run OS X up to 10.4.11 using third-party installation software. G3: Classic 8.1 - 9.2.2, or OS X up to 10.2.8. Can run OS X up to 10.4.11 using third-party installation software, and up to 10.5.8 using third party software if an unofficial G4 upgrade card, enough RAM, and either a PCI graphics card with 3D acceleration or the 4MB SGRAM video memory expansion module is installed. Starting with the iMac, Macs have fully embraced the industry-standard Open Firmware BIOS instead of its homegrown Toolbox BIOS (while Open Firmware existed as early as the Power Mac era, the implementation on those is somewhat kludgey and they co-existed with the Toolbox BIOS on ROM). However, on early New-World Macs, it is possible to have Open Firmware load the Toolbox BIOS from the hard disk into RAM and chainload it, a technology known as ROM-in-RAM, and is actually necessary for running Mac OS 9 as a stopgap solution while Mac OS X was still being developed. This feature was removed from later G4 Macs and is absent from G5 Macs. The iconic Mac of the Unreal / Quake era. Starting with its direct ancestor, the Power Mac G3 family, Apple dumped the homegrown chipsets of the Beige PCI era and went with a solution based around a Motorola "north bridge" and ATI GPUs; this saved money and actually increased performance. CPU: PowerPC 7xx (called "G3" as the third-generation PowerPC,) 233-700 Mhz. 32 MB to 1 GB. Up to 1024×768 with built-in monitor, up to 1600×1200 on an external monitor. Classic OS 8 or 9. CPU: PowerPC 7xx ("G3"), 74xx ("G4"), or 970 ("G5"), 300 MHz-2.7 GHz. GPU: PCI or AGP graphics cards: ATI Xclaim, Rage, or Radeon, or NVIDIA GeForce. 64 MB to 8 GB. G3, early G4: Up to 1600×1200. Later G4, G5: Single or dual link DVI, 1920×1200 or 2560×1600. Starting mid-2005, Apple ditched Motorola's Power architecture for Intel's x86/x86-64 after Motorola failed to deliver a G5 Power CPU that runs cool enough to be placed on a laptop. With this move, Apple also ditched Open Firmware in favor of Intel's revolutionary EFI BIOS (which is only recently started to be embraced by the PC world). The first few generations of these Macs are only 32-bit capable, while newer generations are fully x86-64 compatible (the latter being the necessary requirement to run Mac OS X Lion, thus the 32-bit machines are only capable of upgrading to Snow Leopard). CPU: Intel Sandy Bridge (Second Generation) Core i5, 2.3-2.5 GHz, or Sandy Bridge (Second Generation) Core i7, 2.0 GHz. The Core i5 2.5 GHz machine can be sized up to a Core i7 2.7 GHz CPU to the tune of an additional US$100 if buying from the Apple online store. GPU: Intel HD Graphics 3000 (Graphics Memory scalable from 288MB to 512MB depending on system RAM) using shared memory on i5 2.3 and i7 2.0 Mac Minis, or ATI Radeon HD 6630M with dedicated 256MB for i5 2.5 and i7 2.7 Mac Minis. 2-8 GB, unofficially scalable up to 16GB. Graphics shared memory starts at 288MB at 2GB, scales to 512MB at 8GB on Intel HD Graphics 3000. The ATI Radeon HD 6630M models has 256MB of dedicated graphics memory. Single via either HDMI or DisplayPort, or dual link HDMI+DisplayPort. Can drive two monitors at 1920x1080 independently. GPU: ATI Radeon HD 5770 with 1GB GDDR5 Video RAM, a second card can be added if the need to drive more than two displays arises. However, multi-GPU processing (i.e. SLI/Crossfire) is not possible due to lack of driver support, even though the hardware theoretically supports it. Again, user upgradeable at the expense of warranty. Entry level at 3GB DDR3-1333. Official maximum is 64GB, however it is unofficially upgradeable to 128GB. If the Mac Pro ships with CPUs running below 2.66 GHz, DDR3-1066 RAM is used instead. DVI and HDMI. One card can drive two displays. Ascended Extra: Hardware engineer Burrell Smith, who started in the service department before showing that he knew so much about the Apple II that he was given the job of designing the Mac without actually being promoted to engineer. Also Jean-Marie Hullot, whose SOS Interface program for the early Mac became Interface Builder for the NeXT machine; Hullot's career came full-circle to working on development tools at Apple until 2006. Bunny Ears Lawyer: Software wizard Andy Hertzfeld's book (at the link above) hints at Burrell Smith having bunny ears tendencies, including threatening to urinate on Steve Jobs' desk if Jobs wouldn't let him quit. Jobs himself wore some pretty big bunny ears. Computer Equals Monitor: The signature design of many Macs, including the first Macintosh, many models inbetween (notably the SE and Performa series), and the iconic iMac series, which is what most people visualize of when talking about Apple's computers. Creator Breakdown: Steve Jobs, circa 1985. His egomania got so out of control that company infighting led to his firing...after which he founded NeXT (whose main product eventually became Mac OS X) and became CEO of Pixar. The Dev Team Thinks of Everything: The Macintosh was one of the most carefully crafted computer platforms to that point in computing history — menu bar at the top of the screen to give the mouse an easy target, windows that could automatically redraw themselves, and an entire architecture of "resources" that allowed users to hack around with their software without needing the source code. The ultimate, however, was the RoundRect — the ubiquitous rounded-corner rectangle of street signs, luggage, and cafeteria trays was made an important graphics primitive at the urging of Steve Jobs himself. Double Standard / Hypocritical Fandom: With Apple's recent resurgence, there have been concerns of a Double Standard recently in that Apple will not get as much vehement opposition and criticism in comparison to Microsoft when it comes to being just as shifty and underhanded in their quest for your money as well as other notable controversial business decisions also done by Microsoft's competition (Monopolies and/or dominance of a market, Following the leader, etc). Jon Stewart finds it quite puzzling that Apple has had a heavy-handed tendency to enforce litigation against anyone who leaked details of unreleased or rumored products, yet they are still looked at as a better light than Microsoft. For Want of a Nail: Averted with the Resource Manager, which was almost canned by a petulant manager, crammed into a tiny sliver of memory by developer Bruce Horn, and turned out to be one of the most important design elements of the entire system. Said manager also once almost fired Andy Hertzfeld, the main programmer of the Toolbox, the main Mac OS API, and chief architect of the OS itself, over the insubordination issues — the guy was once in the Navy, y'see. George Jetson Job Security: Former Apple Employees claim that working under Steve Jobs was like this. He Who Fights Monsters: The original "1984" commercial had the Mac as the one fighting against corporate power for the freedom of choice. Now, in a world with a Mac App Store and a heavily guarded iOS Store, it has become the very thing it tried to avoid. In Name Only: Mac OS X is a pretty awesome operating system, but what it isn't is anything even remotely resembling the original Mac OS except in overall appearance and support for some Classic technologies and data formats. Switching between OS X and Classic is almost as big a jump as switching between Mac and Windows. Mac OS X 10.7 ended up getting rid of Carbonized apps (due to removal of Rosetta), applications that can run both Mac OS 9 and early Mac OS X. It Will Never Catch On: People have been saying this almost throughout the Mac's history. Starting in 1998 alone (only halfway back to the start of the platform), we've had people saying that the iMac, USB-only for peripherals, the lack of a floppy drive, the iPod, Apple retail, iTunes and its proprietary music/audiobook/TV/movie store, the iPhone, the App Store, and the iPad were all destined to be massive failures. Instead, each was a spectacular success and is part of the reason why Apple Inc. is now worth more money than Microsoft. Killer App: Aldus PageMaker and Adobe's PostScript printer language were a natural fit for the Mac's graphics-intensive interface and taught a generation how to do page layout and design without Linotypes, pasteboards, and expensive and cryptic optical pagesetters. For NextStep / OS X, the killer app was arguably the platform itself, with its highly sophisticated programming toolset. Murder the Hypotenuse: Steve Jobs arguably did this to the Mac cloners, which were perceived as cannibalizing Apple's market share rather than growing the platform overall. Most anything Apple management did in the 1990s, Copland being just one of these decisions. Only Steve Jobs' return saved the company from the fate of Sega, as the companies seemingly competed on shooting themselves in the foot more spectacularly. They were little better in the 1980s — choosing, for example, to market the original Macintosh for $2,500 to preserve the high profit margin instead of a much lower $1,500-$2,000 price point the Engineering insisted on, thus crippling the machine's market share from the very beginning. Ousting Steve Jobs from his own company and replacing him with a sugar water salesman. Apple were pretty directionless from then until Jobs' return. No Good Deed Goes Unpunished: Ellen Hancock, Apple's chief technology officer, was responsible for the NeXT merger and Steve Jobs' return (and therefore more or less directly for saving the company), but Jobs ridiculed her into resigning. No Plans, No Prototype, No Backup: Bill Atkinson, who programmed most of the graphics subsystem for the Mac and its predecessor the Lisa, was seriously injured in a car accident while still planning regions, a critical part of the graphics package. Jobs rushed to the hospital to see what Atkinson's condition was. Atkinson responded "Don't worry, Steve. I still remember regions." Product Placement: Macs appear so often in media, there's an entire Trope about it. Punny Name: The Macintosh is named after a breed of apple, making it a pun on the name of the company that makes it. The Red Mage: Arguably software architect Andy Hertzfeld, whose business card literally read "Software Wizard" and who was responsible for numerous diverse ideas, as well as much of the Toolbox API. Screw This, I'm Outta Here: Since Steve Jobs' return, Apple has been remarkably successful at doing this — blindsiding a reticent Avid with Final Cut Pro, dumping IBM's Power architecture for Intel when IBM couldn't deliver 64-bit laptop chips, and giving Adobe a brown pants moment by banning Flash from iOS (leveraging the ubiquitousness of the iPhone and iPad to eventually get mobile Flash canned altogether). Most recently, they've been upping the pressure on Intel, with their iOS devices running on ARM architecture, and in-house builds of OS X apparently capable of doing the same. Spin-Off: The iPhone, iPod touch and iPad (collectively, the IOS platform); the Pippin. Spiritual Successor: The Mac, to the Xerox Alto and Star systems; Microsoft Windows, to the Mac; NextStep to the Mac, Mac OS X to NextStep. Windows in part was a direct sequel, because its inner workings and API were inspired by the Mac in a great deal. It still retains Pascal function calling conventions in its API, despite being written in C, as most Mac software, including the parts of the OS, was written in Pascal, and early versions of Winword and Excel were little more than the ports from the Mac, where they were born. Springtime for Hitler: The very popular "I'm a Mac and I'm a PC" ad campaign actually ended up inspiring more support for the goofy PC, largely because Mac comes off as a Smug Snake who rubs his superiority in the goofily endearing PC's face. John Hodgman himself, however, is a Mac user. Take Thats at Microsoft are strewn about as Easter eggs. The aforementioned egg also counts as a Heroic / Villainous BSOD. Team Pet: Clarus the Dogcow, introduced in Apple's famous Tech Note 31. Clarus originally came from one of Susan Kare's font designs and eventually became the standard image for printer setup dialog boxes. Tech Note 1031 came along years later to show how to create a 3D rendering, as well as giving some of the history. Theme Naming: OS X releases have been named after big cats (Cheetah, Puma, Jaguar, Tiger, Leopard, Snow Leopard, Lion and the forthcoming Mountain Lion), and later versions of the Classic OS had musical names (Tempo, Allegro, Sonata, Rhapsody [the first version of OS X], as well as the never-shipped Copland and the never-existed Gershwin). Took a Level in Badass: The move from 68K to PowerPC, the move from OS 9 to OS X, and the move from PowerPC to Intel. Viewer-Friendly Interface: The old-world PowerPC Macintoshes were the inspiration of this trope. Hardware errors are indicated with an Icon of a Sad Classic Macintosh with a bunch of (commonly ignored) numbers in small font underneath it and usually with a heart-skipping sound being played back from the speaker. Also, system crashes were indicated with just a large bomb, a message saying that the system has crashed and needs to restart, and a restart button, with no technical details displayed at all. We Will Use Wiki Words in the Future: Apple was at least partly responsible for mainstreaming CamelCase terminology through the 1980s. Where Are They Now: Many of the original Mac development team left Apple to do great things in their own right, including Smith and Hertzfeld founding Radius to make graphics hardware for the Mac and Atkinson retiring from computers to become a nature photographer. Hertzfeld now works for Google, and Smith is retired, having parted ways with him at some point for the reason Andy chose not to disclose. Susan Kare went with Jobs to the NeXT, but is now an independent graphical designer. Working Title and Sure, Let's Go with That: After years of Mac fans referring to Apple products by their code names (especially the confusingly named G3 PowerBooks, best known to users as Kanga, Wallstreet, Lombard, and Pismo), Apple started using the code names of OS X releases in its marketing, starting with 10.2 Jaguar. This page was last edited on 12 June 2018, at 01:33.